Can You Handle These Deep Fried Nutella Balls?! Melbourne is clinging to its love of Nutella with chocolate-covered fingers. 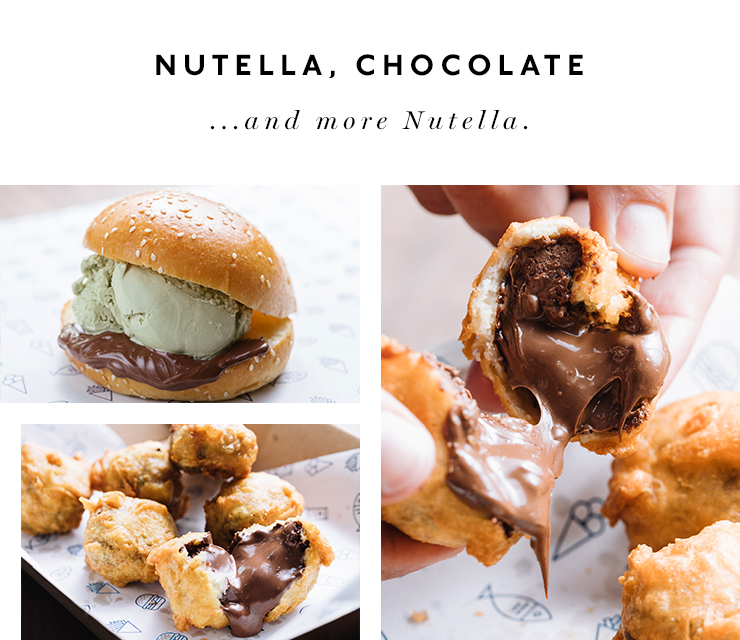 From Nutella freakshakes to Nutella-filled doughnuts, Nutella-topped ice-cream and Nutella pizzas, this city’s obsession with the decadent, creamy spread has just levelled up. Introducing the deep-fried Nutella ball. Encased in a crispy, battered ball (which let’s be honest is just a platform for holding chocolate), D’Lish Fish’s Nutella balls are served warm and oozing with sweet chocolate-ly goodness. Caramel fans won’t be able to resist American-inspired Mars bars in batter, which drip with sticky caramel around a crusty, coated blanket. Still low in sugar? Sweet ‘n sour pineapple fritters or classic banana fritters are also served (you guessed it) encased in D’Lish Fish’s signature batter. Gelato burgers, which are exactly as diabetes-inducing as they sound, is the creative alternative to your childhood ice-cream cone. If you insist on starting with an actual, adult-approved lunch or dinner before dessert, there’s certainly no lack of summer-friendly options. Along with a range of locally sourced fish including Atlantic salmon and blue grenadier there’s a selection of seafood and classic old-school favourites to fill you up. Think tender calamari, glistening garlic prawns and plump steamed dim sims. Burgers include the Fish Burger with grilled flake, lettuce, cheese, tomato and addictively creamy mayo. The rotating burger of the month is also a hot pick for warm summer nights. Pair it with a kilo of chips for under a tenner, because that’s the best summer deal we’ve heard of in Melbourne. 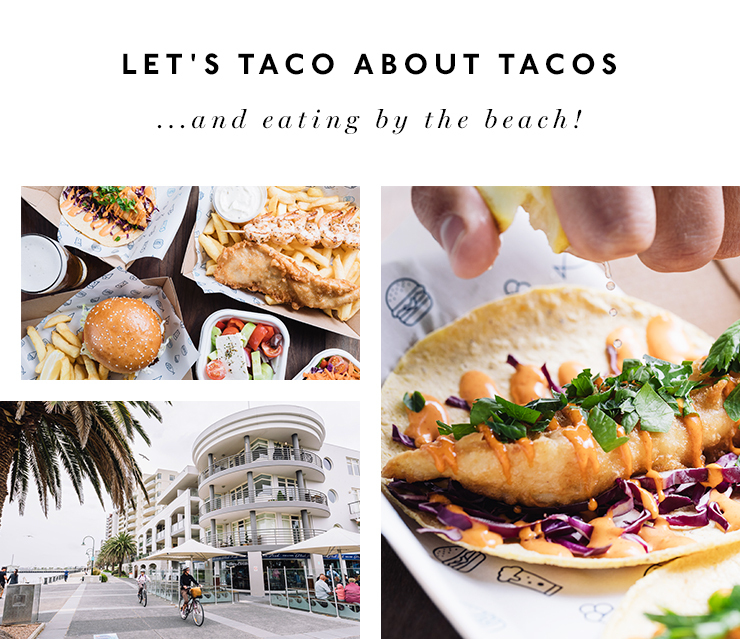 Fish tacos are a non-negotiable for any self-respecting Melbourne foodie. Crispy, tender fish sits on a bed of tangy slaw with a drizzle of chilli aioli. Gluten-free and vegetarians foodies will be pleased to hear that this is one fish and chippery with options other than hot chips. Along with gluten-free dim sims, potato cakes and battered fish, options include vegetarian dim sims and a cheesy V 4 Vegetarian burger is stacked with a plump veggie pattie, tomato, lettuce, cheese and mayo. Brunswick craft brewery Himmel Hünd is available on tap, along with bottled Hills Cider, Stone & Wood and James Boags. A small selection of popular wines are also on offer. The interior, designed by Richmond-based Hecker Guthrie, is clean and promotes share-style dining. Ocean-coloured bar benches, clean timbers and white walls complement the glittering seaside view. It’s perfect for a cool break from Melbourne’s weather, otherwise we recommend taking your food haul from D'Lish Fish straight to the beach. Want to know more about Nutella balls? Of course you do. Head to the D'Lish Fish website for all the details. Editor's note: This article is proudly sponsored by D'Lish Fish and endorsed by The Urban List. Thank you for supporting the sponsors who make The Urban List possible. Click here for more information on our editorial policy.